Capital is pouring into the Canadian marijuana sector faster than ever, as companies prepare for the country’s anticipated adult-use legalization this summer and bulk up for international expansion. 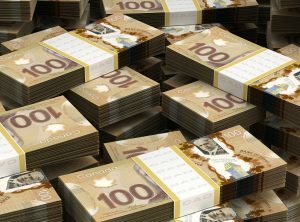 Through the first 10 days of 2018, companies closed on a variety of funding deals or announced financing plans worth at least 978 million Canadian dollars ($780 million), according to a Marijuana Business Daily analysis. That amount roughly matches the CA$960 million raised in the first seven months of 2017. “Canadian cannabis executives are realizing this is probably the last time before legalization when they can sell their shares for two, three or even four times what they were just a few months ago,” said Chris Damas, editor of the Barrie, Ontario-based BCMI Cannabis Report. WeedMD (TSX Venture: WMD) closed a stock sale that will raise CA$34.5 million. Canopy Rivers (subsidiary of WEED) closed a private placement of stock totaling approximately CA$26 million. Organigram (TSX Venture: OGI) arranged a securities sale to raise CA$100 million. Nutritional High International (CSE: EAT) arranged a private placement of securities to raise CA$10 million. MedReleaf (TSE: LEAF) inked a stock transaction to raise CA$132.7 million. DOJA Cannabis Company (CSE: DOJA) closed a private placement of securities worth CA$12.5 million. Emerald Health Therapeutics (TSXV: EMH) closed a stock sale totaling CA$15 million. Maricann Group (CSE: MARI) completed a CA$40 million private placement stock offering. Harvest One Cannabis (TSX Venture: HVST) announced a plans to raise CA$40.2 million. Hydropothecary (TSX Venture: TCHX) inked a stock sale agreement to raise CA$130 million. Aurora Cannabis (TSE: ACB) plans to raise up to CA$230 million through a securities offering. Golden Leaf Holdings (CSE: GLH) entered into a stock sale to raise CA$15.03 million. Liberty Health Sciences (CSE: LHS) struck a deal to raise CA$23 million through the sale of its securities. InMed Pharmaceuticals (CSE: IN) closed a private placement of securities totaling CA$9.4 million. Aphria (TSE: APH) closed a stock sale totaling CA$115 million. Quadron Cannatech (CSE: QCC) aims to raise CA$5 million through a securities sale. Cronos Group (TSX Venture: MJN) increased the size of its stock sale to approximately CA$40 million. I think the intersectionality of the MJ issue is confusing the real market focus. The people who want to smoke pot are already doing so, it is not the BIG MARKET. Sure taxes and all that. I think the edibles will have a bigger impact on people who will use MJ derivatives to aid sleep disorders. Works for me. How big will the market be for sleep products??? But really the game-changing product is HEMP. A world disruptor product. Bigger than pot. I think by Help, you mean CBD. No, he meant Hemp. CBD is just one of a many compounds in Hemp that are beneficial. Hemp as a whole, provide a BIGGER improvement on the planet, and the potential is much bigger than pot. I just can’t begin to tell you how frustrating all your terminology is.